The magnetic luxe eco-compact from Ecco Bella holds the eyeshadow and eyeliner colors you want. Mix & match with a blush, if desired. Keep the compact, and just replace the pans when empty. 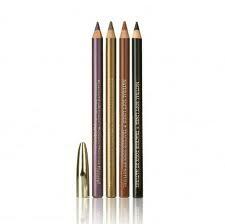 Also available from Ecco Bella are Soft Eye Liner Pencil in four colors. The Soft Liner in Seal is a brown-black that is a perfect natural-looking choice. Bronze has a very slight shimmer, and is a great color for highlighting the eyebrows. All of the Ecco Bella Eye Liners are a nice, softer consistency without being too hard. Ecco Bella also makes a Cover-Up Concealer for the under-eye area in Beige and Medium Beige. In addition, they offer an Eye Nutrients Cream in a convenient pump. All-natural, Organic & Preservative-Free. Ecco Bella Natural Mascara comes in Black and Brown, as well as 'mini' purse sizes for travel. MyChelle eye-shimmer sticks are another all-natural, and fragrance-free alternative. Available in Drama, and four additional shades. Mychelle also has a great Blush Stick as well as a Cream Foundation Stick. Also available are their Little Kisses mineral lip-color sticks.